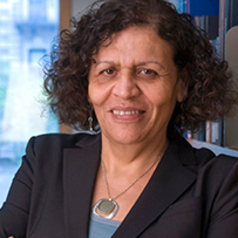 Dr. El-Bassel is the Willma and Albert Musher Professor of Social Work at the Columbia University School of Social Work and Director of the Social Intervention Group (SIG), which was established in 1990 as a multi-disciplinary center focusing on developing and testing HIV, drug use, and gender –based violence effective prevention and intervention approaches and disseminating them to local, national, and global communities. Dr. El-Bassel is also the Director of the Columbia University Global Health Research Center of Central Asia (GHRCCA), a team of faculty, scientists, researchers, and students in both New York and Central Asia committed to advancing solutions to health and social issues in Central Asia through Research, Education, Training, and Policy and Dissemination. Dr. El-Bassel has designed and tested a number of multi level HIV, drug use intervention and prevention models for women, men, and couples in different settings such drug treatment and harm reduction programs, primary care, and criminal justice settings etc. Dr. El-Bassel has been studying the intersecting epidemics of HIV and violence against women and has designed HIV interventions that address these co-occurring problems with significant scientific contributions in gender-based HIV prevention for women. Dr. El-Bassel has been mentoring HIV research scientists from Central Asia and she has also been funded by the National Institute of Health to train underrepresented faculty and research scientists on the science of HIV intervention and prevention. She has published extensively on HIV behavioral prevention science and on the co-occurring problems of HIV, gender-based and substance use. Dr. El-Bassel has been funded extensively by the National Institute on Drug Abuse and National Institute of Mental Health. She also provides significant national and international leadership to the global HIV and health agenda.